The RE7003 3.5-inch is for enthusiasts who require a little less lift than the 4.5-inch system, at a more affordable price. The 3.5-inch Super-Flex™ system features the same ride quality and general trail traits as the 4.5-inch system. The 3.5-inch features new control arms with our Super-Flex™ spherical ball joints, replacement 3.5-inch lift springs extended bump stops, longer front brake lines and Gen II sway bar disconnects. 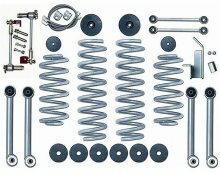 This 3.5-inch system can easily be upgraded to the 4.5-inch version should you decide your TJ/LJ needs more lift in the future. This suspension will allow the use of 33 x 12.5 tires. Note: The installation of a slip yoke eliminator and CV driveshaft on the stock NP231 transfer case is recommended on a TJ. The installation of a CV driveshaft on the stock Rubicon NP241 transfer case is recommended on a TJ. 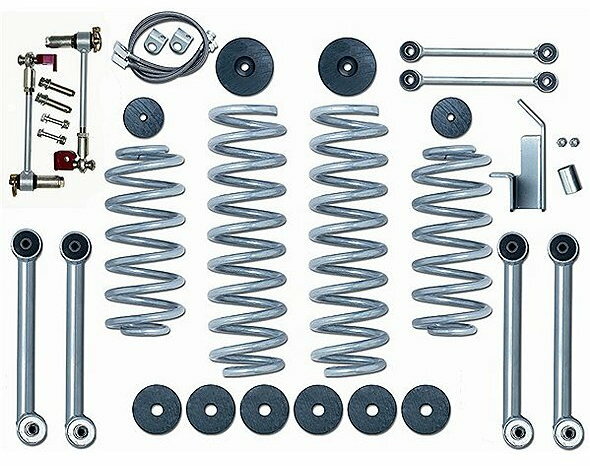 RE1553 ~ BRAKE LINE SET SS FRONT 20"
RE2100 ~ T-CASE LOWERING KIT YJ/TJ 1"